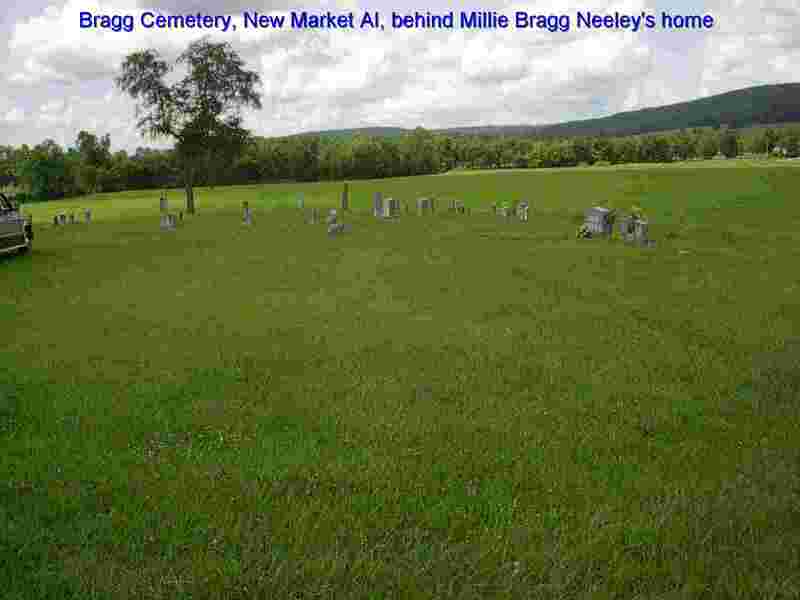 This is the Bragg Cemetery at New Market, it is behind my cousin Millie Frances Bragg Neely and her husband Harvey Neely's home. There are Hickson's buried there and I'll bet he is there. I will hopefully be going to New Market in October, I will ask Harvey if Riley is buried there. Some of the graves only had rocks for markers and Harvey told me there were a lot of folks buried there that he did not know where and since it is a private cemetery, we have no records. Bragg's Tidwell's, Hickson's Golden's are some of the families I know of there. I was just going to tell you if you hadn't already checked. My family owns Bragg Cemetery in New Market, Alabama where I read you believe some of your family may be buried. To my knowledge, there are not any Hicksons buried in the cemetery. The most popular last names are Giles (which is my family), Bragg, Campbell, and Sisco. So who is correct? - Can anyone check? You can find the Madison County Cemeteries listed on the internet.